The innovative, patented SmartCut 4-in-1 Dial-A-Blade Plus 12" rotary trimmer creates straight, wave, perforated and score cuts without changing the blade. The 4-in-1 dial holds all four blades, so making a selection is as simple as turning the dial. A must-have trimmer for more creative projects including classroom crafts, impactful presentations, greeting cards, tickets, photos and more. Straight and perforated blades cut up to 10 sheets of 20 lb. paper. Wave and score blades cut up to 5 sheets of 20 lb. paper. Sturdy, durable metal base and non-slip rubber feet keep trimmer in place. The transparent paper guide eases placing paper under cutting rail. Replacement 4-in-1 Dial-A-Blade and replacement 12" cutting mat are available separately. Self-healing cutting mat for long-lasting durability. Alignment grid and dual scale ruler for precise measuring. Limited one-year warranty. Welcome to MyBinding video. This is a look at the Dial-A-Blade Plus, a Swingline 12 inch rotary trimmer. One of the best offerings of the SmartCut line is the Dial-A-Blade. Four different cuts on one machine. Let's watch it in action. The easy-to-use grid and measuring tools help you get the precise cut. Press down on the rotary's dial and slide in either direction, up or down. That was an easy five sheets. The SmartCut Dial-A-Blade can handle. 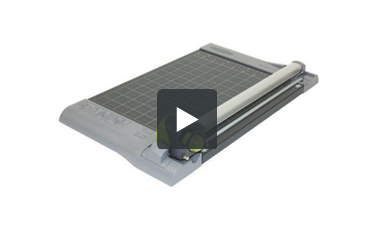 The Accucut A425 looks like a traditional rotary style paper trimmer. However, the A425pro has a special four in one blade mechanism that allows you to quickly change cutting styles for all types of projects. This inexpensive cutter is ideal for use in crafting, scrapbooking for for creating thermal binding covers for your documents. It is extremely simple to use with a quick blade change system that allows you to switch cutting styles within seconds. The A425pro allows you to quickly and easily choose between four different cutting styles including straight cutting, wave cutting, perforating and scoring. You can use the straight cutting blade to cut or trim your documents, the wave cutting blade to create decorative edges, the perforating blade to add a perforated section to your forms and brochures and the scoring blade to prepare items for folding or for creating your own thermal binding documents. The dial-a-blade mechanism on the A425pro allows you to quickly change cutting styles by simply turning a dial on the blade unit. No other cutter makes switching between cutting styles so easy. The trimmer has a 12 inch long cutting length that can easily handle scrapbooking paper, letter sized documents or other sized items. Although it is great to be able to quickly and easily change cutting styles the design of the dial-a-blade unit requires you to replace all four cutting blades at a time if one blade becomes dull. Replacement blades for this unit are somewhat expensive because the entire dial-a-blade unit must be replaced. This is something to keep in mind if you plan on doing any volume of cutting, scoring or perforating with this unit. The unit is rated for cutting up to ten sheets of paper at a time. However, I had difficulty cutting more than 6-8 sheets of paper. Additionally, it is difficult to cut a single sheet of thin paper with this unit since the paper can bend over during cutting. This is a common problem with rotary trimmers but is something worth noting. The base of the unit is somewhat small. This means that it is a little bit difficult to use for scoring, perforating or cutting large format documents. The A425pro is built well but is really intended for light volume applications and home use. It should be fine for this type of usage but most likely will not hold up under heavy usage. It comes with a one year warranty from GBC. However, the blades are not covered under this warranty and as I mentioned before, the blades are somewhat expensive to replace. The unit also uses cutting mats that are a consumable part and will eventually need to be replaced. The A425pro is really one of the only cutters of its kind. The ability to easily switch cutting styles and the inclusion of a perforating blade and scoring blade make it a great unit for craft projects, scrapbooking or for design applications. However, the A425pro is not a commercial grade rotary trimmer and is thus not recommended for applications where any volume of cutting, perforating or scoring will be involved. Still, it is a great machine and is probably the cheapest scoring device that you will find anywhere. Cutting Length 12" 12" 15" 18" 24" 12" 12" 15"
Can the cutting blade cut and score chipboard? The trimmer is typically meant to cut through paper - The trimmer could possibly cut through chip board but it would really depend on the thickness, size and sharpness of blade. Again, this is not the intended purpose of the trimmer and would not reccomend this. Can the straight cut blade be removed for sharpening? We do not recommend sharpening the blade yourself.